Here is what my kitchen looks like today. No, these isn’t the leftover results of the fact that we hosted Thanskgiving for eleven- we cleaned all that up on Friday. This is the result of the fact that yesterday I had an absolute cooking attack. 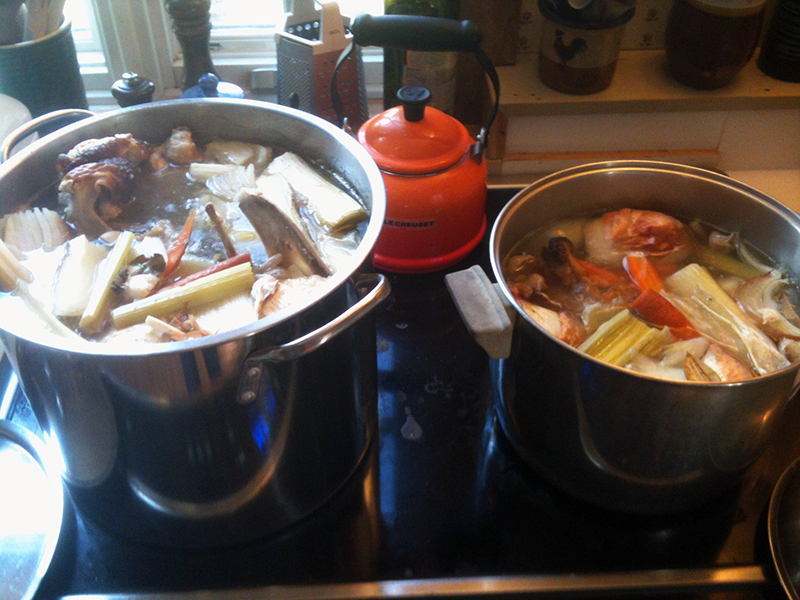 I made turkey stock. I made banana bread. I made white dinner rolls just for the heck of it. The wonderfully ironic part was that none of this was actual entree material; my husband came in smelling all these wonderful smells and asked what was for dinner and I shrugged. Why was I baking and cooking like a maniac? Well, believe it or not, I find it relaxing. And as we all know, the holidays can be a little un-relaxing. After a truly crazy week, (did I mention I had an endoscopy on Wednesday?) my kitchen was my own again. I had a whole Sunday stretched out in front of me, and the lower shelf of my fridge was being hogged by an enormous turkey carcass that wasn’t getting any younger. Eve Translation? Time to don an apron and make a big fat mess. Meanwhile, in the midst of these recipes in various stages of production, I came to the realization that not only had the mice paid a visit to my pantry cupboard (leaving their lovely caraway-seed-poops as incriminating evidence) but so had the flour gnats- who liked it so much they had decided to move in. Ugh. So in between and around all this cooking and baking I began frantically cleaning out my entire kitchen cupboard shelf by shelf. Everything comes out, gets weeded through, and goes back in. Admittedly, I went a little crazy with the Clorox wipes. It felt good though. 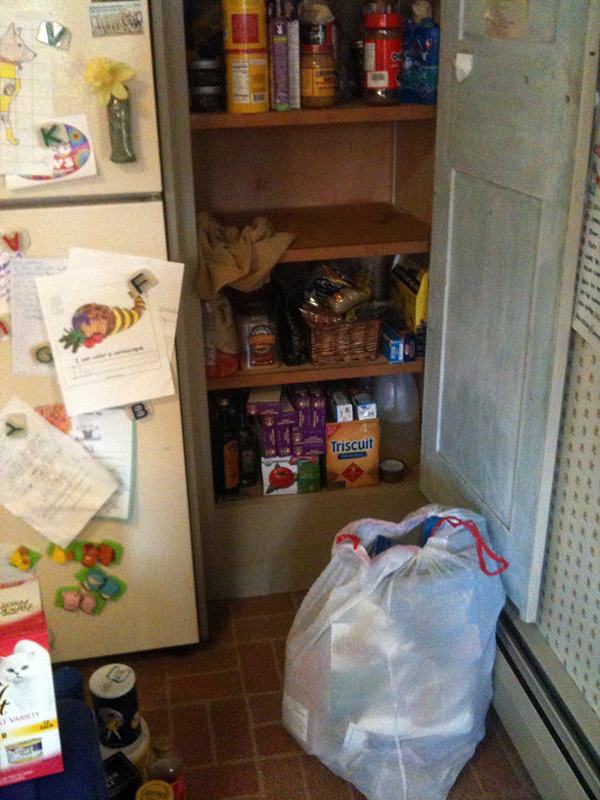 I filled a big bag with cans and boxes to go to the local food cupboard, and my shelves are no longer dusty and disorganized. Treasure-hunt style, I found lots of interesting artifacts: five (count ’em) containers of unsweetened cocoa, several packages of powdered milk, a small bottle of Kalua someone had left here at a party, a two year old box of chocolates, lots of jam and sweet pickles that have been simply shoved to the back of the cupboard all this year, and yes, last year’s Halloween candy. Of course I found all my new tenants too: happily ensconced in the rye flour, the cornmeal and all the dark little crevices buggies love so much. Lucky for me, my twenty-five pounds of white, wheat and bread flours were stored in big plastic bins, or I would’ve had a little gnat Woodstock on my hands. I spent all day in the kitchen, made a huge mess, cleaned up another one, and still got very little done in the way of actual meal-making. It makes me think about how tied to the kitchen women have been in history, how necessary it was for them to not only make the meals from scratch, but to maintain the fire or the stove, the ice in the icebox, the bins of potatoes and squash in the cellar, all the while keeping things clean and keeping the critters at bay… before they had plastic bins. The kitchen, for so many women, was where they lived. Seen in this context, the task of simply going for a year without eating sugar seems laughably easy. As contemporary people with all the modern conveniences, we don’t have to spend all day every day making our meals. Instead, what we’re going to eat is all too often an afterthought- something else we have to do too. The other day I watched a YouTube video documenting a contemporary family’s kitchen in which they use a wood-burning cook stove, an ice box, and light the room by kerosene lamp. Even though it was very charming, and even though I normally love that kind of living history jazz- it nonetheless struck me as a little… silly. 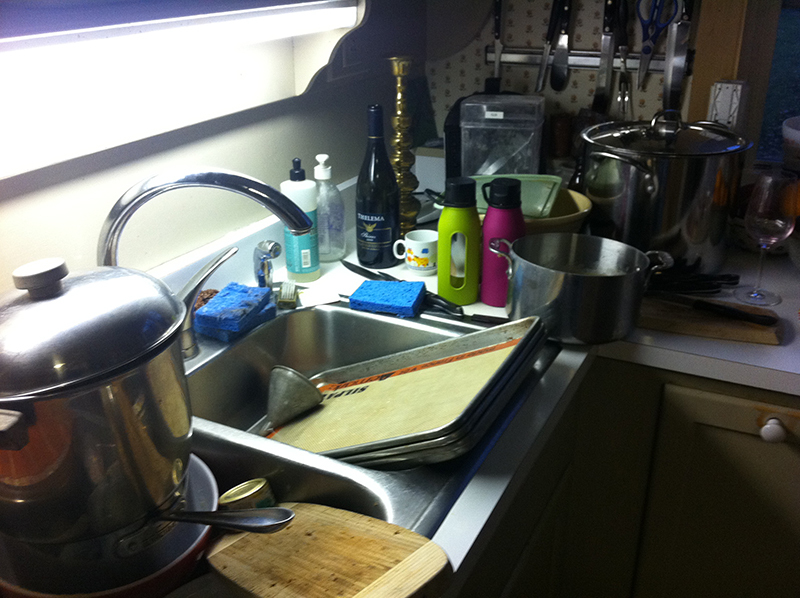 I have no intentions of giving up my dishwasher… you’ve seen what my kitchen looks like even with it. And even though I’ve been railing against plastic lately, yesterday I was all but worshipping my big plastic flour bins. I don’t cook dinner in the microwave, but I do melt butter in it. And don’t even get me started on my husband’s coffee machine- it rivals the Starship Enterprise. Each person must find their own happy medium. But the important thing is, that we give it some thought. There’s no easy answer to how to live in the modern world- but for me some part of it involves making turkey stock, homemade dinner rolls and not giving up my dishwasher. You are currently reading A Year Of No Sugar: Post 85 at Eve O. Schaub.